Internshala, the internships and online training platform, has launched an initiative titled 'Internships for Women' campaign to help women restart their career after a break. In India, about 65-70% women who take a career break fail to return to work, and many women who are well educated and have potential to become a valuable part of the workforce do not even get a chance to begin their career. "As per a BBC report, nearly 20 million Indian women quit work between 2004-05 to 2011-12. 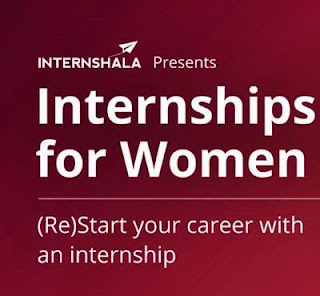 Internshala has proposed internships as a solution for these women as internships are a short-term commitment and provide flexible working hours. Through 'Internships for Women' initiative, Internshala aims to help 4,000 women secure an internship by March 2018," said a statement from the online platform. "A recent TOI article reports that only 27% of working-age women were working in 2015-16. This data highlights the unbalanced Indian workforce which is a major modern-day issue that India is facing and to address this, Internshala has launched the campaign," the statement said. 'Internships for Women' brings employment opportunities for women, in the form of an internship which helps them restart their career. With flexible working options like work from home options and part-time options, women can balance their professional and personal lives. Further, if women want to go back to the workplace, they can opt for office-based internships and make a gradual switch to professional life. As of now, women can apply to over 4,000 internships. "Recently, I came across the story of Ahuti Mishra, a 41-year-old freelance content writer who began her career through a series of virtual internships and it was one of the most inspiring success stories I have ever read. Through this campaign, we want to spread the message that internships are a powerful solution for women to build their career and create more success stories like Ahuti's," Sarvesh Agrawal, the founder and CEO of Internshala said on the launch of the campaign. He added, "Organisations, NGOs, and the government are working hard to create a balanced workforce and this initiative can help create an impact by opening flexible work opportunities for women across India and encouraging more organisations to create internships for women." Internshala was founded in 2010 and provides internship opportunities to over 2.5 million users registered with it. Students, graduates, and women can find internships in a diverse range of fields including humanities, engineering, management, applied arts, science, law, design, hotel management, architecture, and so forth. In 2016-17, +4,00,000 internships (across different streams) were listed on Internshala with an average stipend of Rs. 7,500/- per month.